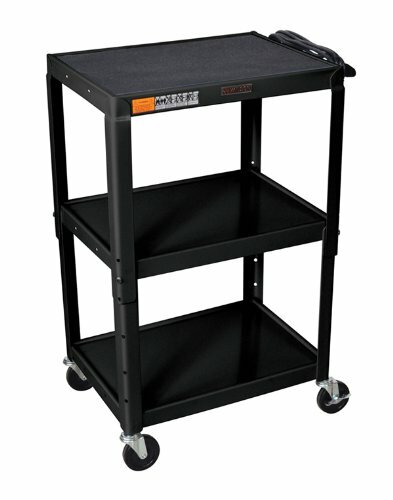 This Black Steel AV Cart has 3 shelves 18" x 24" - adjustable 24-42" Height There is a 1/4" retaining lip around each shelf. Both the top and middle shelf feature holes for cable management. The is arc welded from 18 gauge steel. Includes four 4" casters two with locking brake. 3 outlet electrical assembly with a 15' cord. Includes a non-slip rubber mat for the top shelf. This cart can handle up to 200 lbs.